and entertaining it is filled with new photos and easy-to-understand references and maps, all aimed at assisting the reader in discovering the city’s ancient Masonic history in a visual fashion. There are literally thousands of Masonic references in the ancient city of York; from the mysterious medieval Masons loft in the Minster (which is resplendent in Masons’ marks, Masonic stained glass windows and Masonic symbols) to the beautiful Masonic Hall at Duncombe Place. York has traces of Freemasonry in abundance, and a history of speculative Masonry dating to 1600. Duncombe Place is also the location of the Grand Lodge of York’s rare manuscripts, and this new Masonic guide book of York will include never-before-seen photos of the rolls and manuscripts of this early, independent Grand Lodge. 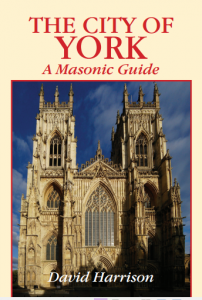 Additionally, the book takes the reader on a tour of the old pubs where the ancient St. John’s Lodges met, and the early Masonic symbolism that decorates the beautiful Georgian town houses of York. The City of York: A Masonic Guide can be pre-ordered now from Lewis Masonic.